Now here’s a car with street smarts. 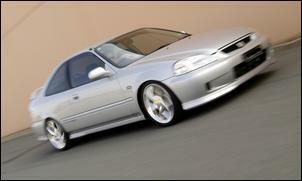 Charlie Azzopardi’s 1999 Honda Civic VTi-R coupe is everything we love in a modified streeter. It’s useable, immaculately presented and visually subdued - and, yeah, it gets along a whole lot better than a stocker too! After stepping up from a Suzuki Swift GTi (which was rolled! 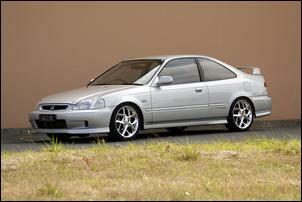 ), Charlie purchased this Civic VTi-R coupe brand new back in 1999. The ‘99 VTi-R coupe is a rare bird in Australia largely because they were originally priced in excess of 30 grand – a fair slab of money for a small, naturally-aspirated 4 cylinder. Anyway, Charlie thought the stock VTi-R was ‘a bit of alright’ but, being a modification junkie, he began throwing some enhancements in its direction. Things began with a set of 17 inch Zepter rims, lowered Fulcrum coil-overs, a Selby rear swaybar, sports rear muffler and cold air induction set-up. 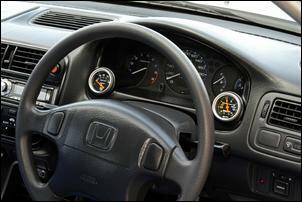 "The muffler and cold air intake made a noticeable difference, especially in the higher VTEC range," says Charlie. It was enough to keep him satisfied, until a couple of years later he just said "aahh, stuff it - time for a turbo conversion..."
Motson’s are AVO (Advanced Vehicle Operations) distributors so there was no need to look any further than the Melbourne-based turbo kit. The AVO turbo kit bolts onto the standard B16A engine and comprises a cast exhaust manifold, a T28 roller-bearing turbo (with a ceramic coated turbine housing), all associated oil and water lines and dump pipe. 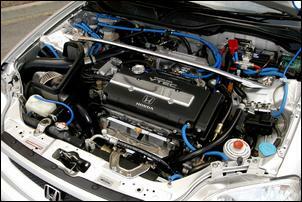 The Stage 2 kit also brings a sizeable bar-and-plate front-mount intercooler and a replacement set of 440cc injectors. The standard fuel pump remains, but control of mixtures and ignition timing is handed to a programmable Link board that’s hidden inside the factory ECU housing. Motson’s eased exhaust backpressure with the fitment of a custom 2 ½ inch mandrel system with a high-flow cat converter and single rear muffler. The intake to the turbo flows plenty thanks to a pod filter surrounded by a custom heat shield fabricated by Motson’s. 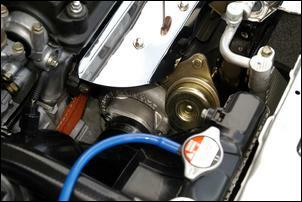 A TurboSmart Type 2 blow-off valve has also been included in the turbo system. Oh and, as you can tell from our pics, Charlie has also treated the turbocharged engine bay to some blue convoluted tubing and a scattering of chrome electroplated parts. With the untouched wastegate actuator providing 8.5 psi of boost, Charlie’s Civic coupe offers a whole lot more grunt than a stocker. In terms of peak power, the standard car previously generated 77kW ATW – these days it’s up to 123kW (a 60 percent gain)! But Charlie says it’s the average torque output that’s revolutionized the way the car drives. There’s double the factory peak torque output and a much beefier spread of torque in the everyday accessible part of the rev range. "From about 2800 rpm it’s on full boost and pulling far better than the standard car," says Charlie. At 5800 rpm there’s yet another shove in the back as the VTEC changes over. The standard Honda 5 speed driveline has tolerated more than 9000km of turbocharged driving without even a whiff of a problem. The only precautionary change was fitment of an organic heavy-duty clutch with a 40 percent stiffer pressure plate. The suspension keeps on keeping on with the Fulcrum coil-overs fitted earlier in the piece while the brakes are given a much-needed boost with slotted front and rear discs. Green Stuff pads are employed at the front while Black Stuff Kevlar pads live at the rear. Honda gave the VTi-R Civic coupe a sporty and practical interior so Charlie’s only mods are AutoMeter boost and oil pressure gauges and some high-end sound gear. An Alpine head unit connects to a 4 channel 100W RMS Orion Extreme amplifier. The amp powers a pair of 6 inch Canton splits in the doors while dual 12 inch Orion sub-woofers thump away inside the boot. Note that a pair of Recaro SE pews has made an appearance since our photo shoot. Visually, this is one of the sweetest Hondas we’ve ever seen – no tacky add-ons here. Charlie went for the optional Honda rear spoiler and skirts when he purchased the car and the appearance is spot-on. Stir in the glamour of a new set of 17 inch Enkei chrome rims (replacing the Zepters), window tint and the complementing factory silver paint and you’ve got a particularly classy ride. Thankfully, Charlie isn’t interested in going too much further with the car – the last thing we want to see is the car taken a step beyond ‘normality’. He says a water spray for the intercooler and an oil catch can are the only mods seriously planned for the future. There’s a possibility he’ll later opt for a forged piston engine rebuild to chase more power – but, then, how much more do you need in a streeter? This car already has the smarts.